She may not be a household name, but Kelly Kretschman is considered one of the best hitters softball has ever seen. 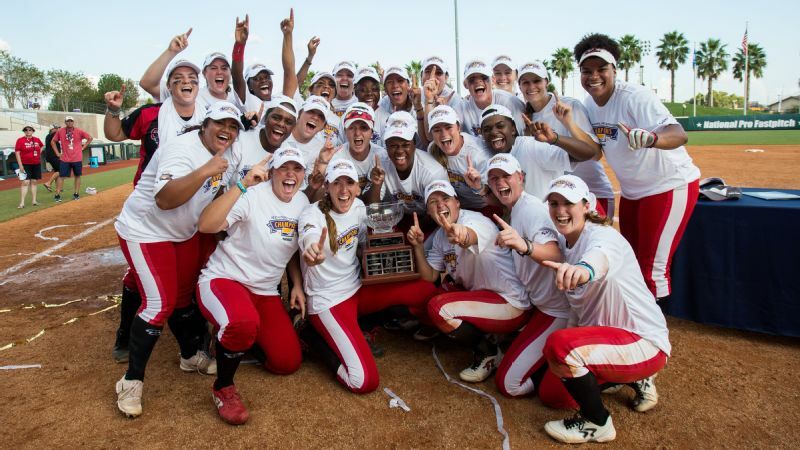 IRVINE, Calif. -- It has been more than two decades since the slight, but Kelly Kretschman doesn't forget much when it comes to softball. So at least as often as Patty Gasso pencils in Kretschman's name atop the batting order these days for USA Blue, one of two United States teams competing in the International Cup, the 38-year-old outfielder prods her coach about a missed opportunity to do the same at the University of Oklahoma. "All she's been doing lately is wondering why I never recruited her," said Gasso, whose other job is as the Hall of Fame coach of the Sooners. "I don't have a good answer for that." It is, of course, good-natured teasing. Gasso had been on the job just a few years when Kretschman came out of high school in Florida in 1997. Four-time champions now, the Sooners didn't have any trophies or a national brand back then. So even if the coach had come calling, it would have been a difficult sell. Kretschman went instead to an almost brand-new program at the University of Alabama and helped transform it into a perennial national power. Much has changed in softball since those days. And not just for the Sooners and Tide. The sport came and went from the Olympics, first contested in 1996, dropped after 2008 but now back for 2020. Kretschman's banter with her coach is a reminder that at least two things haven't changed. Year after year, summer after summer, she keeps hitting her way into lineups. And one of the most confident hitters who ever picked up a bat still can't resist showing people how well founded that belief in herself remains. As the only member of the 2004 team that won in Athens who is still competing, Kretschman is the last link to Olympic gold for the United States. She is back with USA Softball for the first time since 2008 after playing exclusively in National Pro Fastpitch until this year. In sight is a long-awaited potential Olympic rematch against Japan, the team that stunned Team USA for gold a decade ago. "Never did I think this would happen again," Kretschman said of putting on the national team uniform this summer. 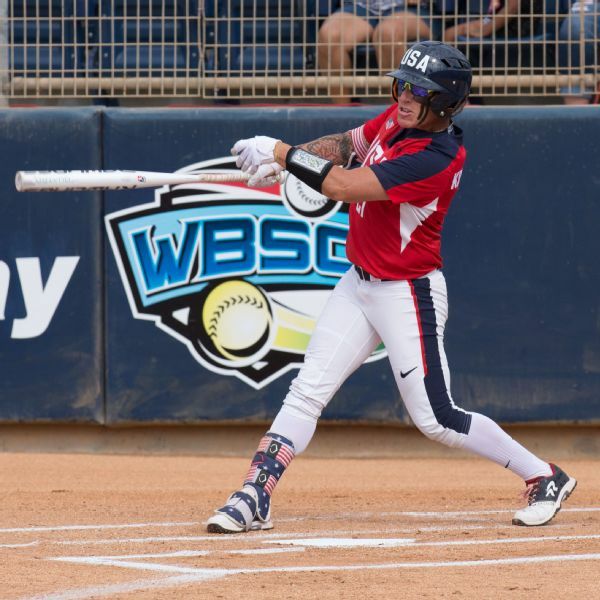 "Once it was out of the Olympics, I kind of made that decision to be done with USA Softball, to try to make the pro league better and kind of get that going. "But once it came back in the Olympics, you just feel that sour taste again." 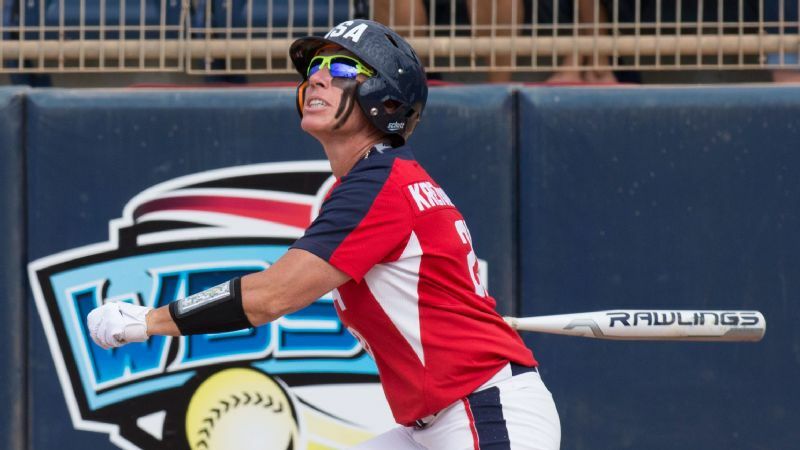 Along with former Olympic teammate Crystl Bustos, Kretschman may be the softball player with the biggest disconnect between her legacy inside and outside the sport. The larger sports world doesn't know her name the way it might Jennie Finch, Jessica Mendoza or Monica Abbott, the other former Olympian who is still on the field. But to those peers, coaches and fans, her name is spoken reverently. Minutes after Florida State won the NCAA title this spring, searching for a way to adequately sum up a legacy, assistant coach Travis Wilson said Jessie Warren was the best pure hitter he had seen this side of Kretschman. In softball speak, that said it all. Kretschman remains Alabama's career leader in slugging percentage, hits, doubles and home runs. She has two of the five best single-season batting averages in National Pro Fastpitch history and three of that league's top five single-season on-base percentages. She hit .500 to win the NPF batting title and player of the year award a season ago at 37 years old. And she is a two-time Olympian who started 17 of the 18 U.S. games in 2004 and 2008. "I still believe she was -- if not the best hitter -- then one of the best to ever play the game," Gasso said. "Maybe she's not hitting bombs every at-bat, but you don't get her out very often." 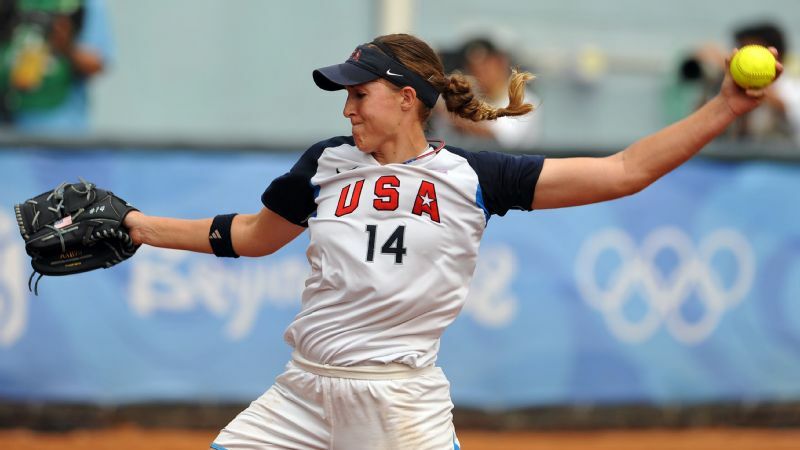 Yet for all those credentials, Kretschman wasn't named to the USA roster that will compete next month in the WBSC World Championship in Japan with a chance not only to defend the world title reclaimed in 2016 but also the first opportunity for the U.S. to qualify for the 2020 Olympics. 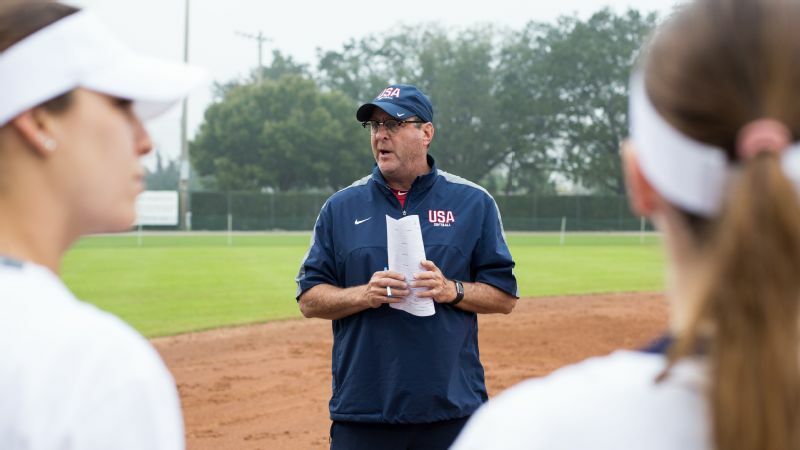 USA Softball named Kretschman to the team now competing as USA Blue in the International Cup, alongside the USA Red team that will travel to the worlds. USA Blue will play Japan on Saturday, and potentially USA Red in a championship game Sunday, but it is the secondary team. Six of its members are active collegians. None is within a decade of Kretschman. A player with her credentials could have taken it as a slight and turned down the spot. She instead took it in stride the way she did when she wasn't on the world championship roster two years before the 2004 Olympics -- or again two years before the 2008 Olympics. She instead doubled up her professional commitments by signing in the Japanese league that competes on either end of the NPF season. Come summer, she showed up for USA Blue. "I've never made a world championship team with this uniform on," Kretschman said. "It's something I guess I was used to. If anything, it kind of fuels my fire. Maybe I've gotten a little complacent playing good softball in the NPF. This made me think 'They think you're not good enough to be on this team, then show them.' That gave me the little kick that maybe I needed a little. But I just love playing. The opportunity to get to wear this uniform, whether it was this team or that team, it didn't really even matter at that point." Kelly Kretschman had a .727 on-base percentage through USA Blue's first four games at the International Cup. Give her a chance to play and she believes she will show you how good she is. She always has. Natasha Watley, one of Kretschman's two former Olympic teammates, along with Laura Berg, who are now coaches for USA Blue, first played against Kretschman in travel ball. And the Californian had the same reaction as many to the brash kid from Florida, still a second-tier softball state at the time. "She was the best one on her team," Watley recalled. "And she was just a cocky little ..."
The last word of the familiar phrase filled in itself. It is a persona that attached itself to her. Alabama coach Patrick Murphy recalled one particular warning he received while recruiting Kretschman from someone who said the player came with an ego bigger than her home state. Indeed, standing in the batter's box, eye black liberally applied and bat flicking like a tiger's tail as she waits for the pitch, Kretschman cuts a menacing figure. She doesn't do hair bows, and there isn't an endless stream of chatter coming from her station in the outfield. She sprints when she needs to and saunters when she doesn't. If that comes off as cocky, so be it. In a day and age with the likes of Ronda Rousey and Arike Ogunbowale, female athletes may be finally free to swagger without risking backlash. Free to be themselves. Freer, at least. For someone older than Abby Wambach and Venus Williams, that wasn't always so. "People thought that she didn't care or she was lazy or this and that," Watley said. "Now we're more encouraging girls to be confident and be a little bit cocky. Definitely, I think the times have changed in that aspect." And it is that lack of artifice that so often makes the first impression different from the second. "She's got the biggest heart, one of the most loyal teammates I've ever had," Watley said. "She's just a softy. Her outer shell does not match her inner self at all. I think she has to wear the eye black to seem intimidating. But once you get to know her, she's a softy, big time." USA Blue (4-0) is counting on that as much as her quick wrists and bat speed. Kretschman has delivered thus far, going 6 for 9 with two walks and five runs scored at the International Cup. Vague memories of her kindergarten teacher at St. Paul's School in Merced, California, are about all USA Blue outfielder Bubba Nickles remembers from 2004. She doesn't recall watching the United States win softball gold that year. Nor does she remember Kretschman's five extra-base hits in the tournament. But by the time Nickles, who recently completed her second year at UCLA, tried out for Team USA, she knew more than enough about one of the all-time great hitters to be a touch intimidated by ending up on the same team when players were split into four squads at tryouts. "Everything I've learned from her I'll take for the rest of my softball career." 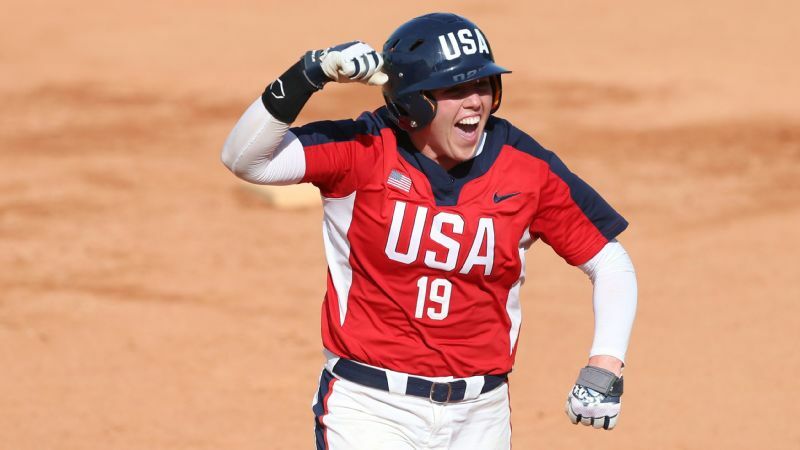 When USA Blue's Nikki Udria hit a grand slam during a game against Colombia earlier this week, Kretschman was among the last to reach home plate from the dugout. She has seen a lot of home runs in her years and didn't need to be in the middle of the celebratory crush. But she circled around behind the pack as it eventually made its way back and gave Udria a two-forearm bump that was obviously familiar to both ahead of time. Then she found Hannah Flippen, one of the runners who scored, and put a hand on top of her helmet as she spoke a few words to her. "I have a great opportunity to help our team because we are so young," Kretschman said. "More important to me is growing the game and helping people get better. I've done everything in my career you can possibly do, so if I can make them better and in two years see one of these girls on the Olympic team, then I can look back and be happy with that as well." Kretschman generally means what she says. But don't expect her to stop hitting anytime soon.